Beauty In The Mirror: Elemis- Fabulous TSV Tomorrow on QVC! Elemis- Fabulous TSV Tomorrow on QVC! Elemis have an amazing TSV tomorrow (Saturday 1st September) which is not be missed! To celebrate 10years of the Cult Favourite Papaya Enzyme Peel. Elemis have teamed up with an exciting new charity SOCO. For every product sold Elemis will provide a 5-in-1 Pentavalent vaccine to immunise a child in Africa against 5 leading diseases. The Papaya Enzyme Peel has been vamped up by British designer Laura Oakes, she designed a beautiful exotic print which is very eye catching. The anniversary Papaya Enzyme Peel has been included in a gorgeous anti-ageing kit made up of Elemis's favourites, this is an EXCLUSIVE set just for QVC viewers. 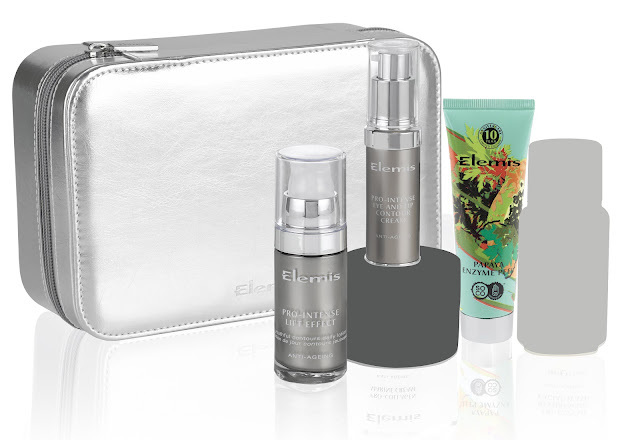 The kit includes five Elemis anti-ageing products including NEW Pro-Intense Lift Effect, NEW Pro-Intense Eye & Lip Contour Cream and two other favourites which will be revealed live on air, along with the price. However you will be saving over a whooping £70!! The collection will be presented in a gorgeous silver keepsake box! Making it the perfect treat for yourself or the perfect gift for someone special. I know I'll be staying up tonight to watch the midnight episode. I love watching the Elemis shows, I sit with my pad and jot down all the tips. With Christmas around the corner this would making an amazing gift, or why not split it up and make a couple gifts from it! Will you be tuning in and treating yourself or a loved one?